Rory McIlroy turned to his wife, Erica, and asked her to change the password on his Twitter account. “What to?” she asked. “To something I will never, ever guess,” he replied. No, McIlroy is not the first sports superstar to turn away from that most interactive and public form of social media, and neither would he be the first to find the urge to return irresistible. But, McIlroy insists, he is out of it for the long term. McIlroy was referring to the spat with Steve Elkington, the Australian who won the USPGA Championship in 1995. After McIlroy missed the cut at last month’s US Open, Elkington accused him of looking “bored” and inferred that he was happy merely to sit back “on his four majors and his $100 million in the bank”. Cue the backlash. While many “liked” his retort, there were also those who thought the “200 million” part flippant and, at worst, boastful. McIlroy obviously regretted it, and no wonder. He is the last person to make a show of his wealth. Yet beneath all this Twitter knockaboutery was a more serious point which pertains to McIlroy’s profession itself. The world No 4 allowed Elkington under his skin and, although McIlroy claimed it was “because he is a former major winner and someone who should realise how hard golf is at times”, it still proved that, in sport, there are few things as brittle as a golfer’s psyche. Elkington is a renowned loudmouth who is nowhere near McIlroy’s level as a golfer or, most definitely, as a human being. He should not be able to pry on any insecurity when it comes to McIlroy. That he was able to is because golf is this most maddening of sports which ensures that the competitor’s mind is beset by self-doubt. Even when that competitor seemingly has everything in the world. In fact, especially when that competitor seemingly has everything in the world. When McIlroy was young, Padraig Harrington told him to desist from reading anything written about him. 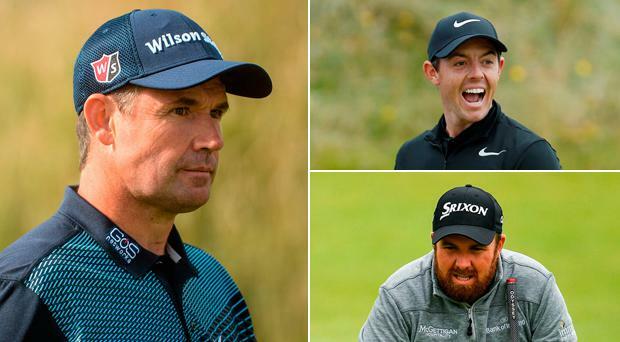 Now, in the age of Twitter and Facebook, Harrington advises the same to Shane Lowry, another Irishman considering logging off due to all the criticism. “I say to Shane as a sports person, you are foolish to let everybody outside your immediate circle influence how you operate, and reading social media is letting outsiders have a part of you,” Harrington said. They all go to Harrington for advice on this issue, not just because of his vast experience as a three-time major winner and as someone who gets the very most out of his talent, but because of his unbreakable positivity. When asked how it could be that in each and every tournament he plays in he still truly believes he can win, Harrington came out with a classic line. “Shane says I believe I can win even on the weeks I’m not playing,” he said. That is the perfect attitude and it is fostered by “not letting anyone else in”. When all things are considered, this could be one of the wisest decisions McIlroy has ever made.